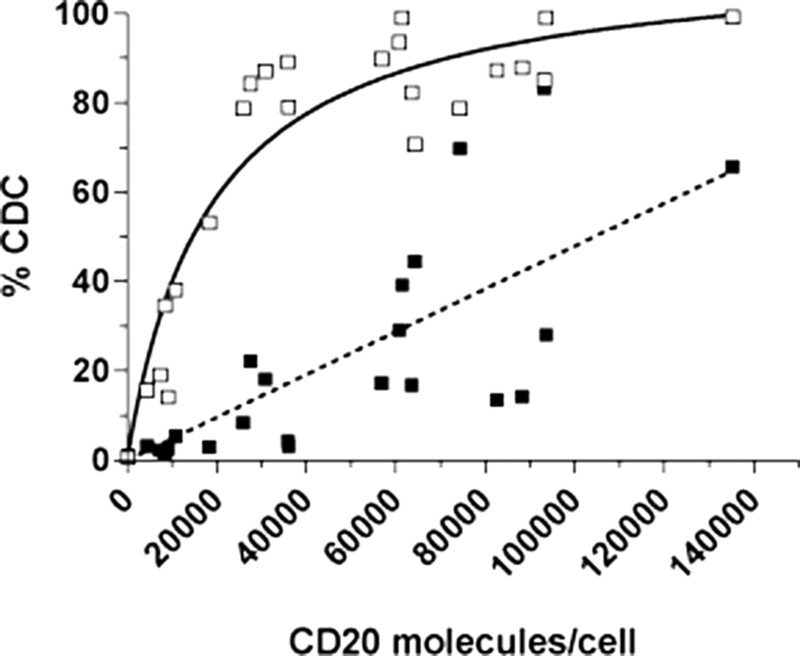 Anti-CD20 mediated CDC of cells expressing varying amounts of CD20. CEM cells were virally transduced with human CD20 and clones expressing different levels of CD20 selected as described in Materials and Methods. CDC activity was assessed by incubating each CEM-CD20 clone with 10 μg/ml 2F2 (□) or rituximab (▪) mAb, adding NHS (50% v/v) as a source of complement, and determining lysis by PI exclusion in flow cytometry after 30-min incubation at 37°C. The results show that 2F2 induced significant lysis of CEM cells expressing low levels of CD20, whereas rituximab was unable to mediate full lysis of these cells, even when expressing >100,000 CD20 molecules/cell. Binding characteristics and CDC activity of CD20 mAb. A, Binding curves using 125I-labeled antibodies. First, 125I-labeled IgG of rituximab (▪), 7D8 (▴), and 2C6 (○) were incubated with Daudi cells for 2 h at room temperature. The cell bound and free 125I-labeled mAb were then separated by centrifugation through phthalate oils, and the cell pellets together with bound Ab were counted for radioactivity. B and C, Dissociation of CD20 mAb. Daudi cells were incubated with 5 μg/ml FITC-labeled IgG of rituximab (▪), 7D8 (▴), or 2C6 (○) for 1 h at 37°C to achieve maximal binding. 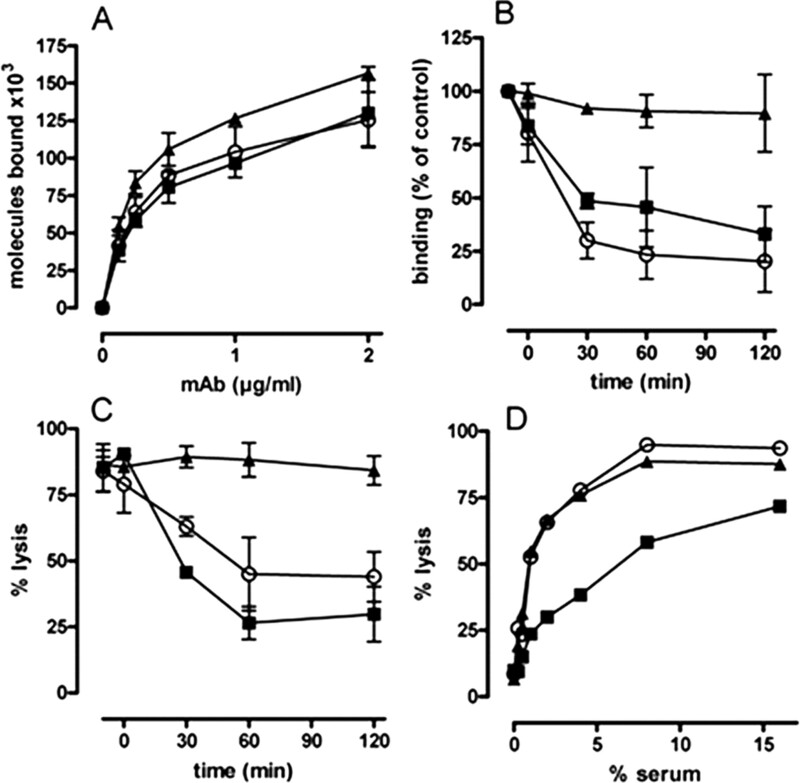 Excess CD20 mAb (rituximab) Fab′ fragments were then added to prevent the labeled mAb from rebinding, and at intervals over the next 2-h culture duplicate aliquots were taken to determine the levels of mAb bound to the cells (B) and the CDC activity of the bound mAb (C). The CDC activity was determined by addition of NHS (16.6% v/v) and PI exclusion as described in Materials and Methods. Representative of three experiments with similar results. 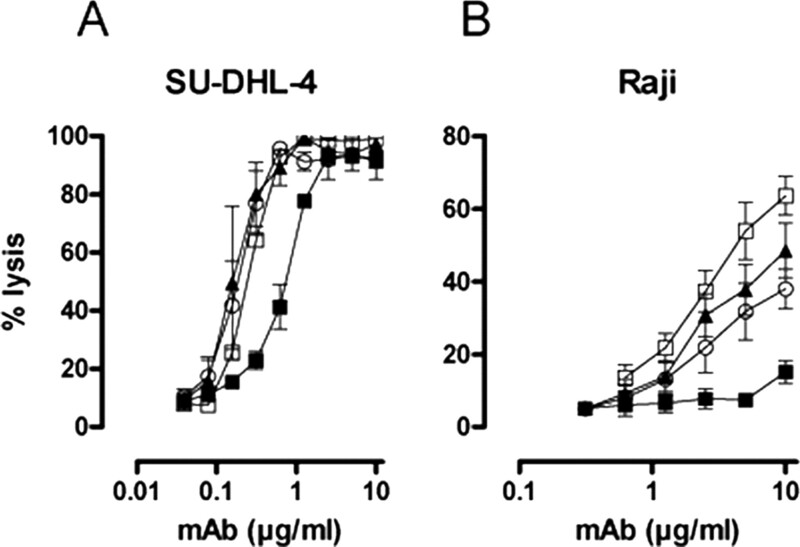 D, CDC activity of CD20 mAb with increasing levels of complement (serum). Daudi cells were incubated with saturating levels (1 μg/ml) of IgG from rituximab (▪), 7D8 (▴), or 2C6 (○), for 45 min at 37°C to allow binding equilibrium. Serum was then added to the level shown and after a further 30 min at 37°C, CDC was assessed by PI exclusion. This experiment was performed twice with similar results. The results in this figure are shown as mean (±SEM). Anti-CD20 mAb-mediated CDC of B cell lines. SU-DHL-4 or Raji cells were incubated with different concentrations of 2F2 (□), 7D8 (▴), 2C6 (○), or rituximab (▪) followed by addition of NHS (16.6% v/v) as a source of complement and incubation at 37°C for 30 min. CDC activity was determined by flow cytometry using PI exclusion as described in Materials and Methods. The results shown are the mean (±SEM) of at least two (SU-DHL-4) and four (Raji) separate experiments. Differential sensitivity of CD20 epitopes to detergent lysis. Immunoprecipitation of CD20 by rituximab, 2F2, 7D8, and 2C6 from Raji B cells lysed in either 1% Tx-100 or 1% digitonin. The mAb were added to cleared (13,000 × g) lysates as indicated to immunoprecipitate CD20. Samples were analyzed by anti-CD20 immunoblot, as described in Materials and Methods. Note: the contaminating lower molecular weight bands are Ig human/chimeric L chain detected by cross-reactivity of the HRP-conjugated polyclonal rabbit anti-mouse IgG. Ab binding to the AxP variant of the large CD20 extracellular loop. Wild-type (WT) human CD20 and the construct 2 from Table II (A170SxP172S) were expressed in HEK293F cells. Binding of the CD20 mAb was monitored by flow cytometry and the binding to construct 2 expressed as a percentage of binding to wild-type CD20. Results are expressed as the mean (±SEM) of between two and four independent experiments. Ab binding to variants of the CD20 large extracellular loop. 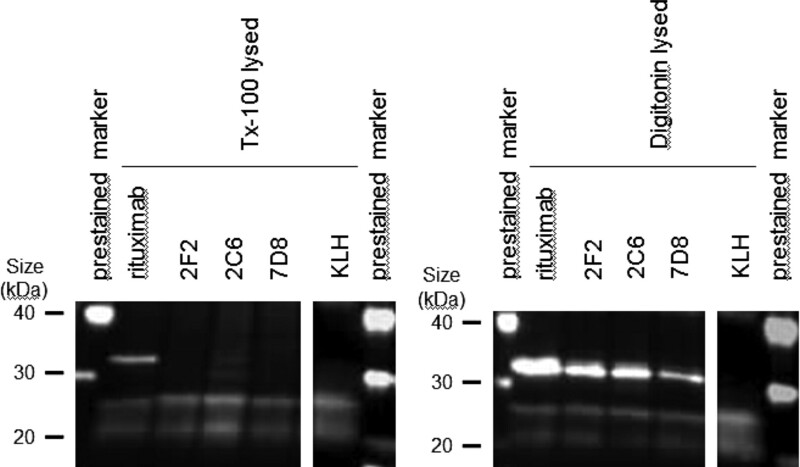 Construct 4 (N163D) (A), construct 3 (N166D) (B), and construct 6 (KDD) (C) from Table II and wild-type CD20 were expressed in HEK293F cells, and binding of the CD20 mAb was assessed as described in Fig. 5. Results show mean values for two to six independent experiments. 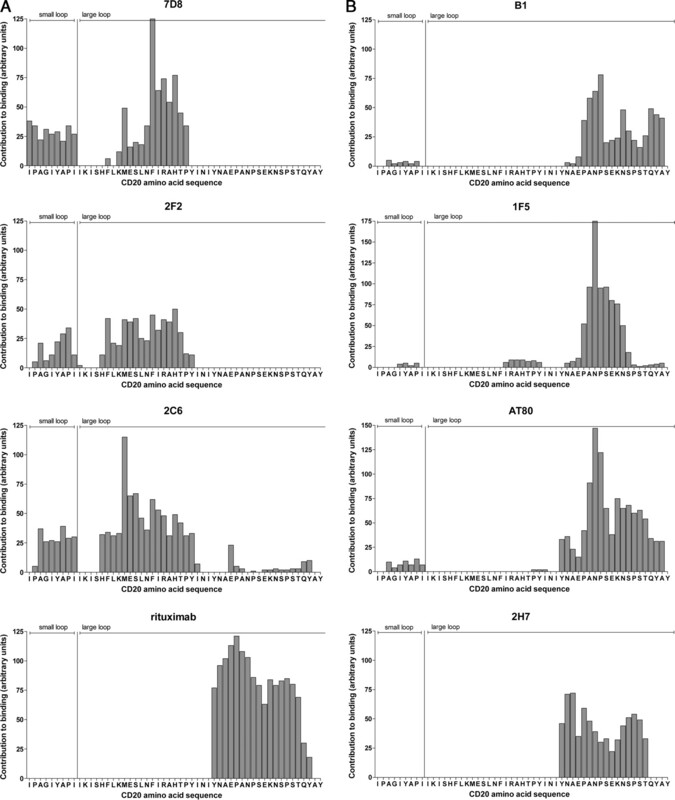 Analysis of the binding of human CD20 Abs to CD20 15-mer peptides. Peptides spanning the entire amino acid sequence of the extracellular loop of human CD20 were immobilized in multiwell plates and tested for their reactivity with the either human CD20 Abs (7D8, 2F2, 2C6 and rituximab) (A) or mouse CD20 Abs (B1, 1F5, AT80 and 2H7) (B). The CD20 Abs were incubated at 10 μg/ml and their binding was assessed with peroxidase-coupled rabbit anti-human IgG. The contribution of each CD20 amino acid to Ab binding (arbitrary scale) was measured as described in Materials and Methods. a All F(ab′)2 and Fab′ fragments were produced as detailed previously (44 ). a Table shows the predicted amino acid sequences for the extracellular regions (small, 72–80, and large, 140–186) of human and mouse CD20. Differences between the sequences are highlighted in gray. 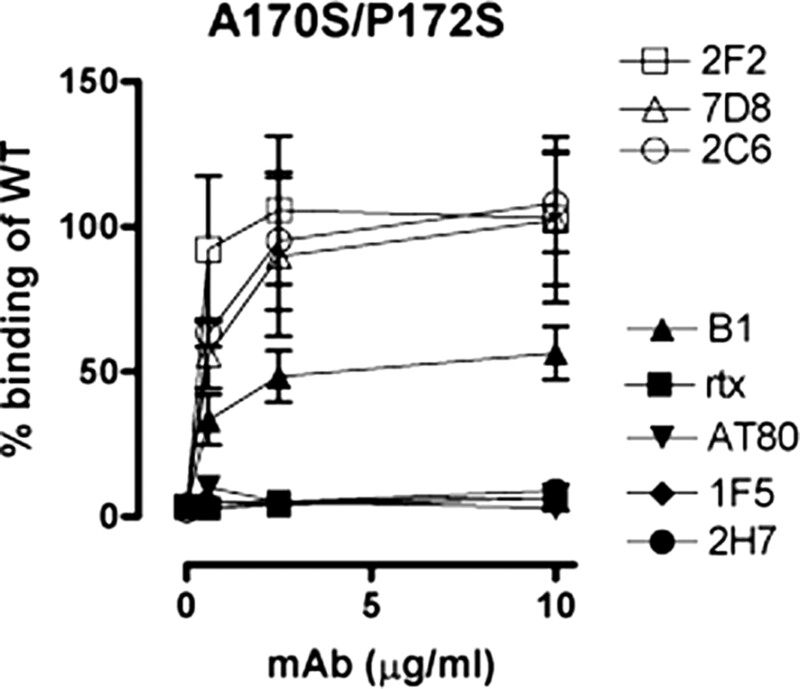 The proline at position 172 (bold/underlined) is critical for binding of rituximab and other mouse CD20 mAb (28 ,29 ). The human CD20 large extracellular sequence (boxed region) was mutated to the murine sequence producing constructs 1 through 6. Mutated residues in each construct (1 ,2 ,3 ,4 ,5 ,6 ) are highlighted in gray. Wild-type human CD20 and the constructs were expressed in HEK293F cells, and binding of anti-CD20 mAb to transfected cells was monitored by flow cytometry. a The P172, which has been found critical for the binding by rituximab, is marked in bold and underlined. Highlighted areas indicate core contact regions for the different CD20 mAb. The core amino acids were identified by testing the reactivity of CD20 mAb to a large set of linear and variable loop peptides as described in Materials and Methods.